The first plane flew over Baku city s century age, on October 20, 1910. The childish and unstable french biplane of “Farman-4” system driven by Sergei Utochkin made several rotations over the heads of surprised spectators, then landed with thunderous applause. Azerbaijan got the official status for the new type of air transport in the region after 15 years of acquaintance with aviation: “TCAJS” Trans-Caucasus Civil Aviation Joint-stock Society was founded in 1923. “Mughan Melioration Construction”, “Caspian Shipping”, “Azneft” were its founders. Planes of “TCAJS” were intended to be used in the aero photographing, in the delivery of prompt cargoes and in the post transport. “Yunkers” plane realized its flight in the Baku-Tbilisi-Baku route in April, 1923, two years later an aerodrome and a civil “Air station” were constructed in Keshla. In 1926, there were constant flights on the Mineralnie- Vodi- Grozny- Makhachkala- Baku- Yevlakh- Tbilisi routes. In those years airports with the “Dornye-Comet-3” and “Dornye-Mercury” were put into operation planes in Baku, Yevlakh, Sheki. The crew of this planes consisted of two people. Kharkov- Baku- Pahlavi international route was opened in 1929, and a flight was realized to Moscow over the Caucasus that shortened the length of air road for 1 100 kilometers for the first time in 1933. The constant Baku-Moscow route was opened in 1937, and the local “XAI-1” and “Stal-3” (Сталь-3) planes that served to 15 passengers every day. This was a substantial figure for that period. The first aviation group in Azerbaijan was formed on June 2, 1938. This date has been declared the Azerbaijan Civil Aviation Day with the Decree of the President of Azerbaijan Republic in 2006. With the outbreak of World War II, aviation routes were mainly used for military purposes. The new high-quality period in the history of Azerbaijan civil air force coincides with the 70-80s of the century. Airports were built in Gandja, Yevlakh, Naftalan, Nakhchivan, Zagatala, Lenkeran, Agdam, Agstafa, Sheki during that period and they were provided with the landing strips of artificial cover. They were capable of receiving “Yakh-40” reactive planes. Now, eleven regions of the Republic have been connected with Baku by air. Airliner park was one of those that bought “Tu-134” and “Tu-154” reactive planes and “Mi-2” and “Mi-8” helicopters in the Soviet Union. In those years, planes became the most famous- fastest, most comfortable and suitable type of transport. After the collapse of the Soviet Union, Independent Azerbaijan Republic invested more than 200 million dollars to the Civil Aviation. This investment allowed to provide the airpark with modern “Boeing-757” planes, to renew flight management systems, to establish the system of preparing up to 20 specialized personnel, and to found an international airplane station in Baku in 1999 that receives aircrafts of more that sixty airline companies. Baku Cargo Terminal was completely constructed in March, 2005 and with this terminal Baku became the unloading point of cargoes that are carried from west to east and from north to south. In the same year, Baku Cargo Terminal became member of IATA-International Airline Transport Association on Ground Maintenance and participated in the International Business Partners Program of the International Airports Council. In the coming years, “Nakchivan” international airport, “Gandja” international airport, and a new airport station building in “Zabrat” airport were put into operation. Besides, “Holiday Inn” hotel was opened in Haydar Aliyev International Airport in 2007. In 2008, “Lenkeran” and “Zagatala” international airports were opened. “Aerobus-319”, “Aerobus-320” “ATR-72” and “Atr-42” airliners were included to the civil air forces. Two third of the park intended for the freight planes was renewed with the modern crafts. In the near future, “Boeing-787” airliner will start regular flights from Baku, Haydar Aliyev international airport will receive “Aerobus-380” airliner. By the Decree of the President of Azerbaijan Republic, the name of “Azerbaijan Airlines” State Concern was changed into “Azerbaijan Airlines” Closed Joint-stock Company on April 16, 2008. Today Azerbaijan civil aviation is relevant to the standards of the International Civil Aviation Organization (ICAO), “Azerbaijan Airlines” Airline Company is member of civil aviation unions, such as ICAO, IATA, ECAC and Interstates Aviation Committee. The greatest share in the Azerbaijan air transport belongs to Azerbaijan Airlines CJC. Azerbaijan Airlines (AZAL, АЗАЛ, “Azərbaycan Hava Yolları”) is part of Azerbaijan Airlines Closed Joint-stock Society. This is an enormous airline company and national airline carrier in Azerbaijan. The Company is member of International Airline Transport Association. The headquarters is in Baku. The main airport of the airline company- Haydar Aliyev International Airport is situated 20 kilometers to the east of Baku city. “Azerbaijan Airlines” carries passengers to Europe, CIS, Near East, and Asian countries. The company plans to open constant routes to Northern America and South-East Asian countries after purchasing a new party of “Boeing” planes with remote flight distance. Now, as the Azerbaijan National Carrier “Azerbaijan Airlines” takes a worthy place in the International Airline Transport Association (IATA), and is leader among airline companies of CIS countries. “Azerbaijan Airlines” is considered one of the leading companies for the number of new airliners both in the region and among CIS countries. Haydar Aliyev International Airport is one of the five international airports in Azerbaijan. Earlier, it was called “International Bine Airport” in accordance with the name of suburban settlement of Baku. On March 10, 2004 it was renamed after Haydar Aliyev, the Nationwide Leader of Azerbaijan. The Airport is situated 20 kilometers to the east of Baku city, and is connected to the city with two modern auto strada, put into operation in 2008 and 2009 respectively. 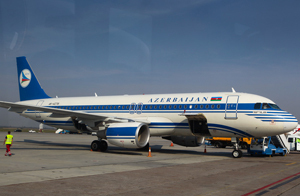 “Azerbaijan Airlines” is the registration port of National carrier. There are duty free trade stores in the International Airport, and unlike other international airports, there are stores not only in the flight zone, but in the landing zone as well. Besides plastic cards, Manat, US dollars, Euro, and Russian Rubl are used for payment in cash.